Y'all. I am about to say something you may not believe. But please believe me when I say, homemade almond milk is REALLY easy to make. It may seem complicated, because how can you really extract "milk" out of a tiny nut. But seriously, trust me. It can be boiled down to 3 easy steps: 1. Soak almonds 2. Blend almonds and water 3. Strain mixture See how easy easy that was? Okay, there is a little bit more too it than that, but not much! First, I soaked my almonds in water over night. You want them to be nice and plump so that they blend more easily and release their "milk". I kept the soaked almonds in the fridge overnight. I put a cinnamon stick in there with them thinking that it might impart some of its flavor, but sadly, that did not work. In the morning, I rinsed the almonds then combined them with about 2 parts water (I had about 3 cups of almonds, so I used 6 cups of water), a vanilla bean, a touch of stevia and blended until there weren't any big chunks left. I then poured the mixture into a nut bag fitted over a bowl and let the milk drain out. When it stopped pouring out on its own, I gave it a little squeeze to get out any excess. Now, you can find your very own nut milk bag at a health food store like Whole Foods. I found this one in the same aisle as the almonds (seems logical enough, but of course I had to ask someone). They are only about $2.50 a piece and I used this bag twice before it tore. So that was it! Told you it was easy! Sure you have to plan ahead to soak the almonds, but once that is done, you can have a fresh glass of almond milk in less than 30 minutes. And how does it compare to the store bought stuff? Store bought is on the left and homemade is on the right. They look almost identical except you can see some vanilla bean seeds in the homemade one. Also, the store bought stuff is a bit more beige in color. Taste-wise there is also a difference. Homemade almond milk tastes like.....almonds. Shocking, I know. In comparison, the store-bought stuff tastes like it has been processed to taste like cows milk, which is what most of us are used to. When added to coffee or milk, you can't really taste a difference. Plus its just nice knowing (and being able to pronounce) exactly what goes into my almond milk. Wouldn't you agree? Pour almonds into large bowl and cover with water. Cover bowl in plastic wrap and set in fridge overnight, or at least 8 hours. Once soaked, drain and rinse almonds then transfer to blender. Add the 6 cups of water, vanilla, stevia, and salt and blend until there are no more big chunks of almond. About 1 minute. Fit a nut milk bag over a large bowl. Pour almond mixture into the bag, lift and let the liquid drain. Squeeze out any excess. 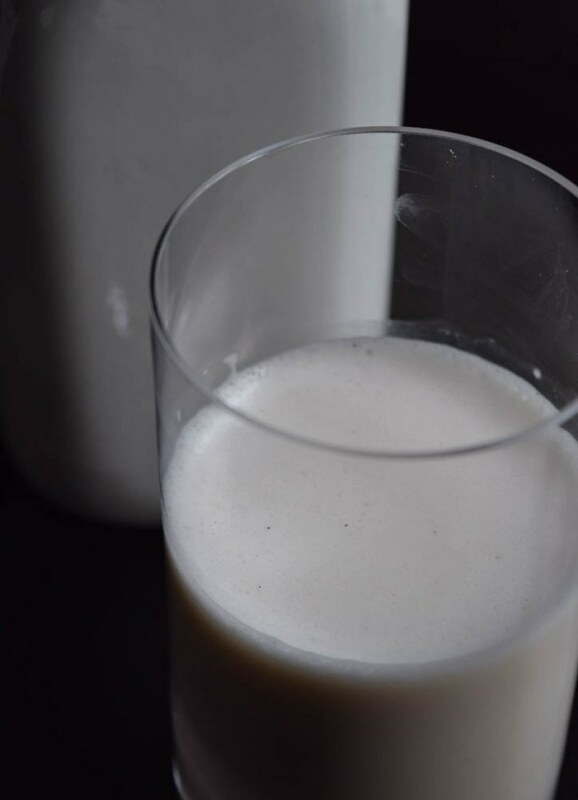 Store almond milk in an air-tight container in the fridge for up to a week. Shake before serving, as it will separate.